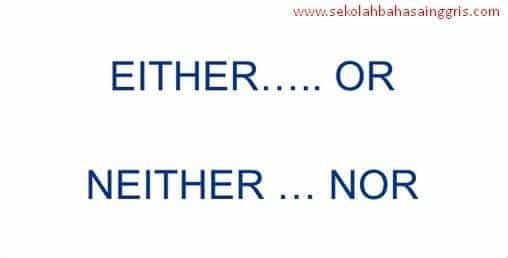 Sekolah Bahasa Inggris – Sebuah hal ini penting untuk memahami makna dan perbedaan antara “either” dan “neither” sehingga kita tidak bingung antara keduanya. 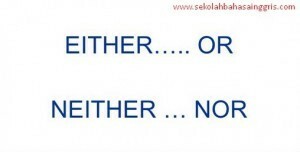 Kedua kata dapat digunakan sebagai pronoun, “conjunction” dan “adjective”; Bagaimanapun, penggunaan “either” dianggap bentuk positif, sedangkan penggunaan “neither” dianggap bentuk negatif. Untuk lebih jelasnya simak baik-baik penjelasannya dibawah ini. You may use either foot for the kicking. = You may use your right or left hand for the kicking. There were big building on either side of the office. = There were big building on both sides of the office. Neither brothers was invited to the party. = None of the brother was invited to the party. Both cars are headed in this direction, you can get on either. = Both cars are headed in this direction, you can get on one or the other. Both pups were pure-breed, but neither displayed the characteristic traits of its breed. = Both pups were pure-breed, but not one or the other displayed the characteristic traits of its breed. I can either watch TV or play games. = I can do one of two things: watch TV or play games. You can neither watch TV nor play games. = You cannot watch TV or play games. If you don’t attend, I won’t attend either. = If you are absent, I will be absent also. Sedangkan Neither tidak dapat digunakan sebagai adverb.